One critique levied against the ITF way of doing the Chang Hong patterns is that the rhythm imposed on the techniques by the sine wave motion has taken away the clustering of certain techniques that ought to—according to these critics—be performed as small combative units glued together by a more “realistic” (i.e. more rushed) tempo, as opposed to ITF Taekwon-Do's slow tempo. The Korean word for a group of techniques that generally go together in a pattern is called “poom” (Hangeul:품; Hanja: 品). An example will be helpful. Take the first series of movements in the pattern Won-Hyo: a twin forearm block, followed by a knife-hand inward strike, followed by a side punch. It is understood that these three moves are part of one combative sequence. Once one finishes movements #1-3, you turn about and repeat them on the other side (movements #4-6). So, movements #1-3 are one poom, movements #4-6 are another poom, and so on. 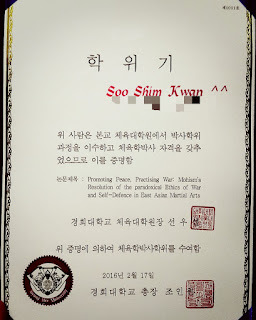 The little video above shows how I as an ITF practitioner* performs the initial two poom in Won-Hyo Teul. Notice the relatively slow tempo. You can see the full pattern performed by Alexandra Kan here, which I think is one of the best ITF performances of the pattern online at the moment. It is believed that in the traditional way of performing the patterns one can know where pooms are by the tempo with which a set of techniques are performed together. Usually, such a cluster is performed together relatively fast, then there will be some pause or slowing down in the tempo, before the next cluster of techniques that form a poom are performed in a similarly hurried fashion. The critique against the way ITF practitioners perform the patterns is that because most techniques are emphasized individually due to the sine wave motion, rather than obviously clustered together, practitioners don’t know where pooms start and finish and therefore lose important combative information, since each poom is understood to be a small combative encounter. I disagree with this critique. Poom need not be identified by a connected tempo. There are other ways of identifying a poom. First, they tend to be a sequence of techniques in one direction. For instance, in the Won-Hyo Teul example, we can easily identify movements #1-3 as one poom and movements #4-6 as a different poom because they are performed in a general direction. Second, rational deduction suggests that these moves go together, without the need of a tempo acting as an adhesive. In other words, we can look at a group of techniques, especially if they are clustered together in one direction as in the mentioned example, and then we can ask ourselves if they logically fit together, and if so we can deduce that they are part of a poom. The ITF patterns are not to be understood as complete fighting templates. First, the patterns are far too structures, far too rigid and angular, far too “formal” to be reflective of actual combat. The pooms are put together in unrealistic ways. One poom is followed by a 180 degree turn, then a 90 degree turn, and so on. The imagined attackers conveniently attack you one at a time from perpendicular angles. These are just some examples of how unnatural and how far removed the patterns are from real combative encounters. I disagree that the rhythm in patterns must be reflective of a real fight. Enforcing a “fighting” rhythm is just adding another arbitrary rhythm—real violence tends to be rather chaotic and often not rhythmic at all. Rather than becoming rushed and chaotic, the patterns are contemplative and structured. Consider for a moment how forms are practised in Taichi Chuan. The critique of unrealistic rhythm and speed is applied to Taichi Chuan only by the ignorant. Most martial artists have the insight to know that although Taichi Chuan forms are performed at such very slow speeds, that is not how Taichi Chuan practitioners actually fight. The slow moving forms teach certain principles of movement and a state of mind that are lost when the forms are rushed. 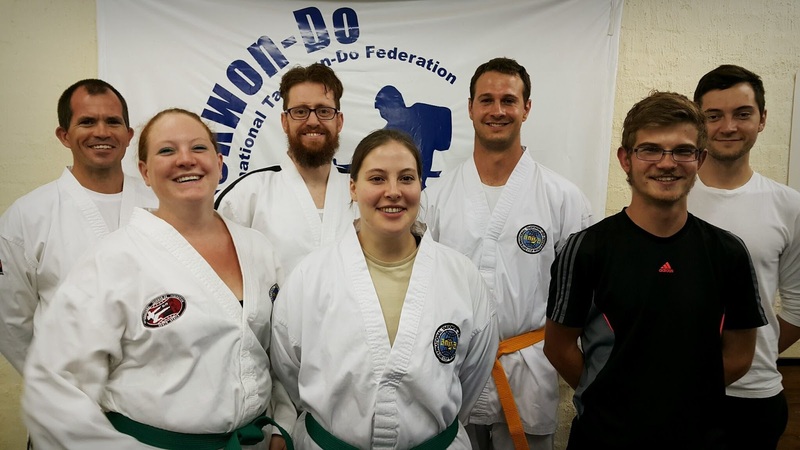 Similarly, although ITF Taekwon-Do uses a relatively slow tempo for performing the patterns, it is also obviously not how practitioners are intended to fight and the slower tempo is purposeful—to teach certain principles of movement. Deciding that certain techniques are part of a poom is useful, but forcing a tempo onto them to boundary movements into a poom is counter-productive. While it might give the practitioner a clear indication of where one poom starts and another ends, it is also limiting interpretation options. Many interesting pattern interpretations occur across pooms. A simple example is in Chonji Teul. 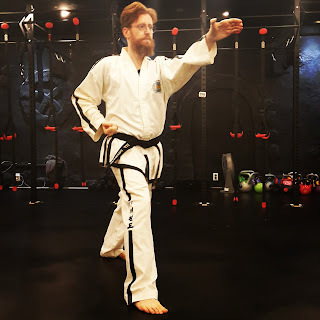 Typically, it is understood that the first poom in Chonji Teul is movements #1 & 2: the walking stance low forearm block, followed by the walking stance middle punch. The next poom is the following two movements (movements #3 & 4), and so on. 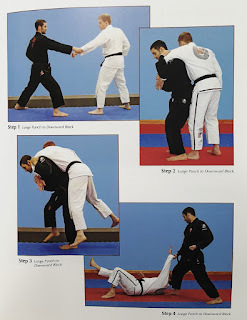 However, one interesting interpretation is to view movement #2 and #3 as part of an over-the-shoulder throw as illustrated below, from the book Taekwondo Grappling Techniques by Tony Kemerly & Steve Snyder. This interpretation dissolves the arbitrary boundaries of the pooms. If one were to stick to the pooms based on how the tempo is performed by “old school” Taekwon-Do practitioners, one may miss this interpretation. When the pooms are not fully fixed, the practitioner can start to play more with different possible combinations. In other words, sticking to preconceived ideas of poom is limiting and stifles creativity. When one does not enforce preconceived ideas of where a poom is supposed to start and finish, it frees one to find more pattern application interpretations. 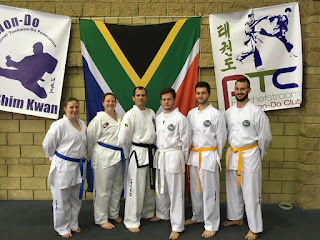 The critique against the ITF way of performing the Chang Hon patterns, claiming that we lose the benefit of knowing where the pooms are, is invalid. An ITF practitioner can just as easily distinguish where the pooms are as people performing the patterns with poom-limited tempos. Furthermore, when ITF practitioners practise the pooms as drills (possibly in step-sparring or other dynamic context drills), they adjust the tempo of the techniques as needed. Practitioners already do this for sparring and self-defence: it is part of the incremental stages of (pre-arranged) sparring in the ITF technical pedagogy. Finally, I think the slower tempo of the ITF patterns are actually contributing important skills and principles, which are lost when the patterns are rushed. 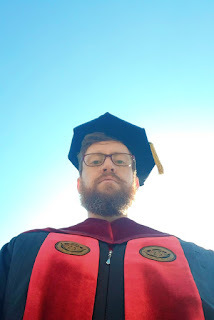 Principles such as relaxation, body awareness and spacial awareness , and an understanding of the acceleration of body mass are only really learned at a slower, more contemplative tempo, rather than at a rushed, supposedly more realistic tempo. The more “realistic” training, I believe, is practised elsewhere in the system. * Although I call myself an ITF practitioner, it is important to note that different ITF groups perform the patterns in slightly different ways. For instance, some practitioners de-emphasize the hip rotation, focusing on the vertical force generated by the sine wave motion. I personally apply both hip rotation and sine-wave motion (where appropriate) in my performance of the patterns. In Taekwondo the arc-hand thrust #반달손 #뚫기 is often used to attack the throat (trachea). 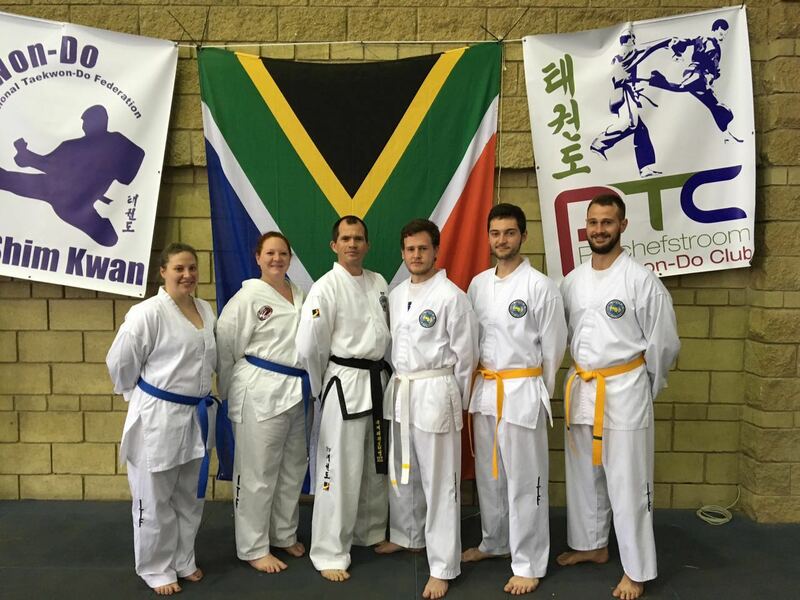 In ITF Taekwon-Do the other hand is sometimes used to pull the opponent closer while simultaneously attacking the throat. One hand thrusts, while the other pulls. 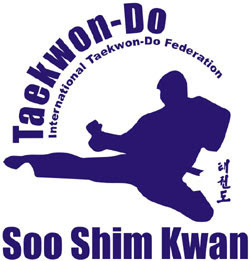 This yin-yang (음양) type movement is one application of the so-called Reaction Force principle, that is part of ITF Taekwon-Do's "Theory of Power". A common variation in Taekkyun 택견 is as a #takedown: the arc-hand pushes the opponent's throat or even face, while the other hand is used to reap one of the opponent's legs, and so topple him. The above is a quote from a post that someone made on a Taekwon-Do related Facebook discussion forum recently. I remember after reading Alex Gillis’ “A Killing Art: The Untold History of Tae Kwon Do” (a must-read) that I felt pretty much the same. 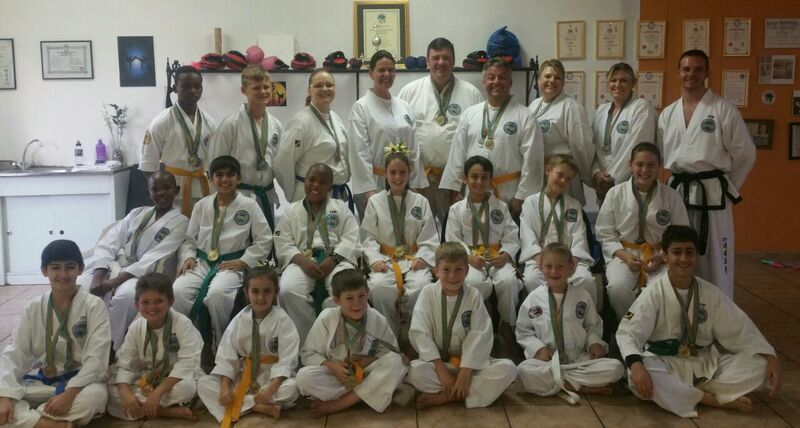 Most Taekwon-Do practitioners have no idea with how much vice and corruption our martial art has been embroiled. That book came as a valuable disillusionment to me. It reminded me not to idolize the Taekwon-Do founders and leaders, and not to over spiritualize Taekwon-Do. Later, it also occurred to me that this very unsavory history of Taekwon-Do actually validates it. Firstly, you don’t hear of flower arrangement being involved in “murder, abduction, assassination plots, bomb scares, political gain and segregation”. 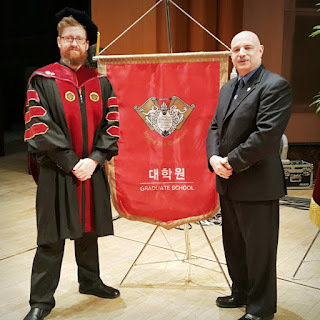 Only something with true gravitas (no offense to those involved in flower arrangement) could have been used—and misused—as has been the case with Taekwon-Do. 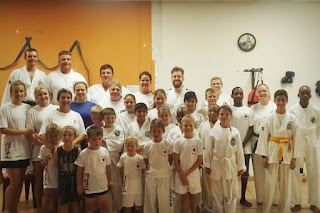 Taekwon-Do is something serious. Something dangerous. This brings me to my second point. A sword, no matter how decorative and aesthetically designed, always remains primarily a weapon. We should never be surprised to see a sword covered in blood. When it does surprise us, it can only be because we did not give it the respect it deserves. Or it surprises us because the “sword” is fake. A toy sword or stage prop smeared with actual human blood is indeed a shocking sight, as should be all bloodshed. But a real sword scarlet-stained from rust, dirt and blood, is simply true to its purpose, so seeing a crimsoned sword should not surprise us. Why, then, should we be surprised when a martial art—i.e. a system of combative skills—is used for power, politics and war? It is true that a sword may be used in conquest or in defence, and in both these cases it may lead to bloodshed, but the sword itself is neither inherently good nor bad for being used in such ways. What determines the value of a sword is not whether it was used to murder in greed or kill in defence, but whether it proved its metal. Was it good at being a sword? Was the blade strong and sharp? Was it balanced and adherent to the wielder’s intent? Considering its diverse history, I think Taekwon-Do makes for a good sword. 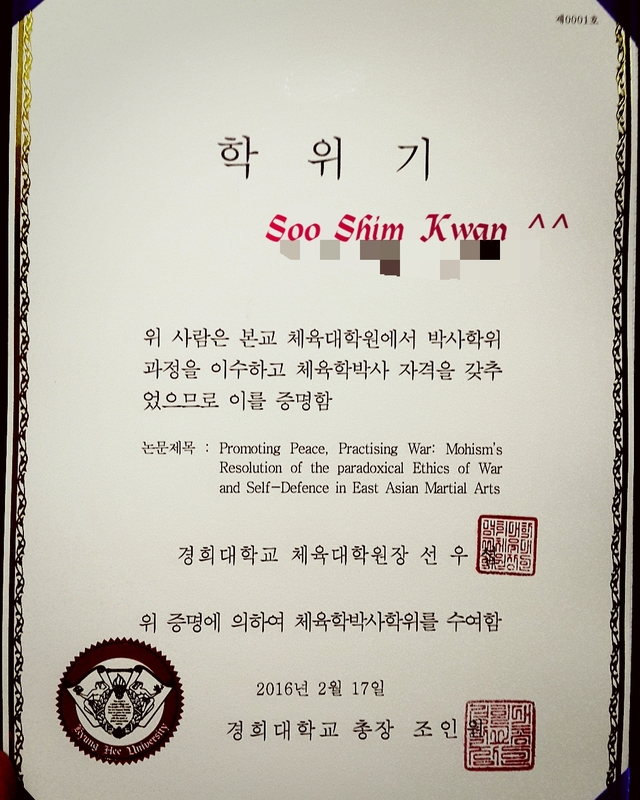 Hello Soo Shim Kwan students and friends. Here is my tentative schedule for the next 2-3 weeks in South Africa, which will include visits and/or workshops at several dojang. Sadly I won't make it to the coastal areas during this trip, unfortunately. 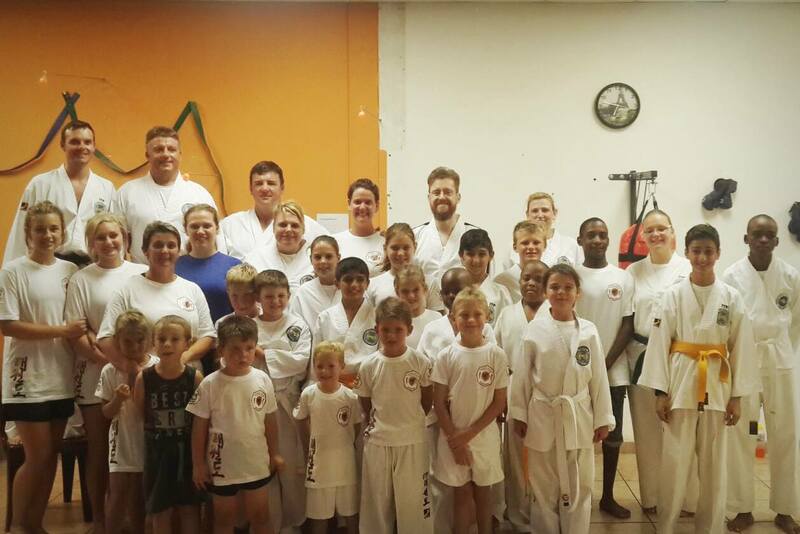 I look forward to training with and seeing you all soon.